Applying for financial aid can seem complicated for students and their families, but the Office of Financial Aid at Rutgers University is eager to guide you through the process. Learn more about how you–the parent–can help your student navigate their financial options through the step-by-step guide provided by the U.S. Department of Education. While the Free Application for Federal Student Aid (FAFSA®) form is the student’s application, we know that families often play a large role in the process. While we recommend that the student start their own FAFSA form, we know that’s not always what happens. With that in mind, we wanted to provide instructions for families who are starting the FAFSA form on behalf of their child so you can avoid running into issues completing the form. Before you begin. Do you need to fill out the FAFSA® for more than one child? Please fill the form for one student and then note the instructions at the end of Step 8. In the School Selection section, you’ll add all the schools you want to receive your child’s information. It is important that you add every school your child is considering, even if he or she hasn’t applied or been accepted yet. It doesn’t hurt to add more schools; colleges can’t see the other schools that have been added. In fact, you don’t even have to remove schools if your child later decides not to apply or attend. If your child doesn’t end up applying or getting accepted to a school, the school can just disregard his or her FAFSA form. If your child is determined to be a dependent student, he or she will be required to report information about you. If your child is determined to be an independentstudent, you can skip step six. This is where you’ll provide your own demographic information. For specific guidance, visit the “Reporting Parent Information” page on StudentAid.gov. In this section, you’ll first be asked to provide parent financial information. This step is incredibly simple if you use the IRS Data Retrieval Tool (DRT). The IRS DRT allows you to import your IRS tax information into the FAFSA form with just a few clicks. Using this tool also may reduce the amount of paperwork you need to provide to your child’s school. So if you’re eligible, use it! 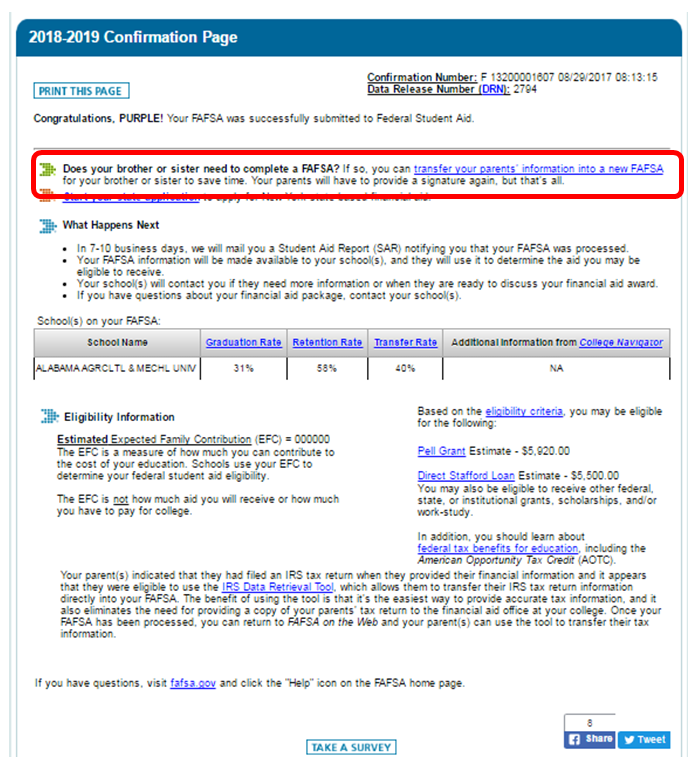 To access the tool, indicate that you’ve “already completed” taxes on the parent finances page. If you’re eligible, you’ll see an option to “Link to IRS.” Choose that option and follow the prompts. NOTE: If you need to save and exit your dependent child’s FAFSA form so he or she can complete the remaining information, you’ll need to log back in and sign your child’s FAFSA form before your child can submit it. You’re not finished with the FAFSA form until you and your child sign it. The quickest and easiest way to sign your child’s FAFSA form is online with your FSA ID. 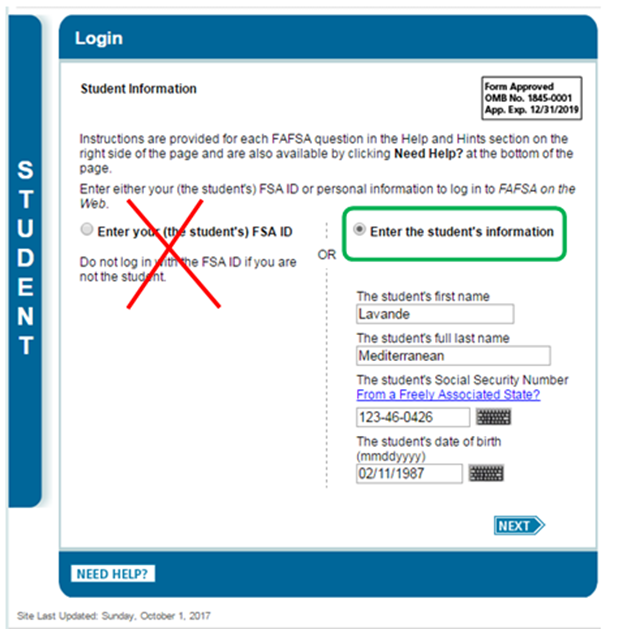 If your child is not present, after you sign your child’s FAFSA form with your FSA ID, save and exit the application and instruct your child to log into fafsa.gov to sign and submit his or her FAFSA form. NOTE: If you have multiple children who need to complete the FAFSA form, you can use the same FSA ID to sign FAFSA forms for all of your children. You can also transfer your information into your other children’s applications by choosing the option provided on the FAFSA confirmation page. Congratulations on completing the FAFSA®! Your child is one step closer to getting money for college.